A scientist by training, Toby transitioned into business as a recruiter, writer, and entrepreneur. 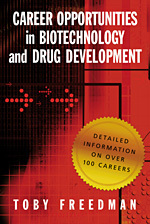 Her book Career Opportunities in Biotechnology and Drug Development was published by Cold Spring Harbor Laboratory Press and provides a comprehensive overview of the many careers in the life sciences industry. Her book covers over 20 vocational areas ranging from venture capital to marketing to discovery research. Toby founded her own recruiting firm, Synapsis Search, which is focused on R&D and business placements in biotechnology companies and non profit organizations. Previously she worked at BioQuest, an executive retained recruiting firm, and before that was Director of Business Development at SLIL Biomedical, a drug discovery company developing therapeutics for cancer. Toby earned a Ph.D. in molecular biology/biology from UNC Chapel Hill, a B.S. from the University of California, and as an NIH Fellow, conducted postdoctoral research at Harvard University and at the University of Texas-Austin. Toby is the Program Chair for the BioScience Forum, a non-profit educational forum serving the San Francisco Bay Area biotechnology community (see www.biosf.org). She also is active in the San Francisco Women in Bio chapter.